Here is the paper, presented at the International Conference on Advances in Computer Entertainment 2010, ACM & SIGCHI at the Interactivity Session. 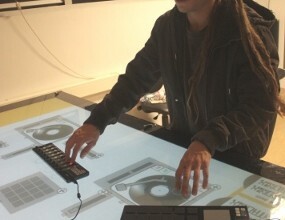 Using my own MtDjing framework, I’ve developed a drumpad for multitouch. Drawing inspiration from the many drumpads I’ve used across the years: My SP-808 is one of the best samplers ever, although it has no pressure sensitivity (called velocity in “musical gear slang”).